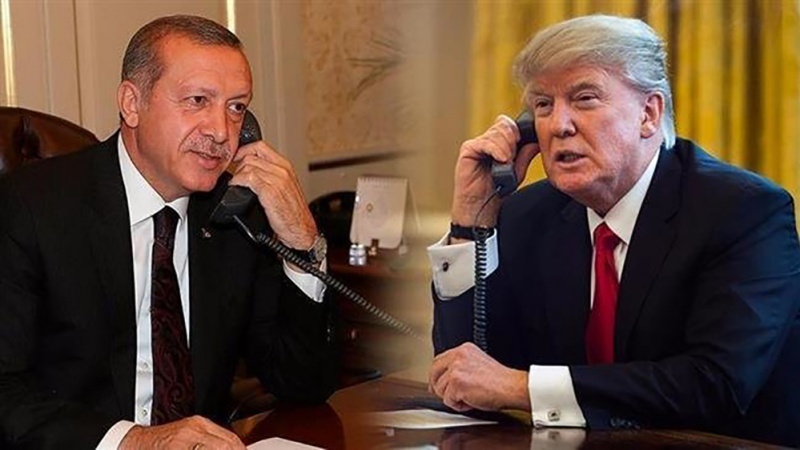 US President Donald Trump has held talks with his Turkish counterpart, Recep Tayyip Erdogan, on the establishment of a militant-free safe zone in northern Syria. This came shortly after Trump threatened to “devastate” NATO ally Turkey economically if it attacks Kurdish militants following Washington’s military withdrawal from the Arab state. The Turkish presidential office said in a statement that the two sides had “discussed the idea of creating a security zone cleared of terrorism in the north of the country” during a phone conversation on Monday. The phone call came amid a war words between Ankara and Washington over the fate of the Washington-backed Kurdish militants in Syria following the planned withdrawal of American troops. Turkey views those militants as terrorists. Trump threatened to devastate Turkey’s economy if it launches attacks against the Kurdish militants in Syria when US troops leave. Elsewhere in its statement, the Turkish presidential office said Erdogan had told Trump that he had no problem with the Kurdish people in Syria, and that Ankara was only seeking to fight the armed groups there that threaten its national security. “The president expressed the desire to work together to address Turkey’s security concerns in northeast Syria while stressing the importance to the United States that Turkey does not mistreat the Kurds,” White House Press Secretary Sarah Sanders said. Trump announced the plan to pull US forces out of Syria last month amid plans by Turkey to launch an operation against anti-Damascus Kurdish militants.